Since its launch back in 2004, the Orkut has had a blue color scheme, and so users who wanted to be more colorful and expressive had to go for Greasemonkey or Firefox addons. But now respecting the popular demand the Orkut rolled out 12 themes to a percentage of Indian users. 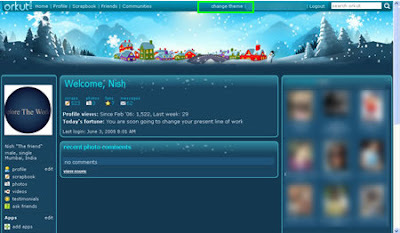 Now we can make our orkut profile reflect our mood for the day or change the theme to match the current season . Click on the "change theme" link in the top navigation bar or go to the"themes" tab in the edit profile page. You'll then see our gallery page, where you can check out all the themes that are currently available. Alternatively, if you visit a friend's profile page and he has a theme you like, click on "get this theme." When you select a theme, all your orkut pages will have this theme: your profile, scrapbook, photos, videos, etc. 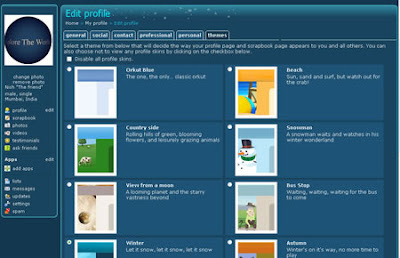 When other users visit your profile or other pages, they will see your selected theme. So go ahead, be colorful! Express yourself.